Canning CEO choosing Canning CEO? Strong, confident CEO selection process? The City of Perth fired its CEO as it refreshed its council and took the CBD in a new direction. Quick, clean. Done. But not Canning…..
Our first democratically elected council in years not only kept on a CEO appointed whilst Canning was under administration (Lyn Russell – responsible for many questionable decisions since), it rushed her on to the panel that will select her successor. Is the difference between these two councils one of self-confidence? Why? Canning’s new governance got in on claims of impressive skill sets: risk analysis, paralegal process, efficiency, public service, good governance and board management…. but while it’s been busy pumping out populist policies like “disclosure registers”, and arranging personalised stationery, there’s concern it hasn’t got a grip on what really counts. To make matters worse, two of the four councillors appointed to the selection panel – Margaret Hall and Lindsay Holland (heavy critic of the previous council) – took off on extended Leave of Absence, smack bang in the middle of the process*. While they flip off dealing with ratepayer queries for weeks, do they still intend to take part in the ongoing CEO selection process? Is it ethical for councillors to participate in selecting for their most important staff whilst officially excused from duty? I presume they’re still getting paid…. Then there’s the fact CEO Lyn Russell chooses to use an eastern states recruiter – Blackadder & Associates, who don’t appear to have a local office (“We have had the privilege of undertaking more than 200 assignments for local Councils in NSW, Victoria, Queensland and the Northern Territory“). Is there a reason why our City can’t use highly regarded WA-based recruiters Lester Blades and Gerard Daniels, like other councils? As for the ad – was it germane to tell the nation we have a “highly respected CEO”? Most just get to the point…. Last time Ms Russell appointed an executive (Director of Corporate Services) Blackadder was used – but all we got was a bloke from down the road. Canning’s then Director of Corporate Services went off to the City of Albany to be its new Chief, and Albany’s then Deputy CEO, and its Director of Corporate Services, traded that job for the same one at Canning – sans Deputy status. Pretty expensive, pretty ordinary outcome, in other words. And we are taking in a string of post-collapse Albany executives why now? It wasn’t necessary to retain our current CEO, following the long-awaited return of a council and with the skill set it sold us on. New council, new slate. Ms Russell knows the drill – her two previous appts ended prematurely. It certainly isn’t necessary to have her on the selection panel for her own replacement. Confidence does seem to be an issue with this council, having just voted themselves huge training allowances for each year they’re in term, but at the end of the day we pay executive recruiters a lot of money to guide councils through selection processes, from short listing to watching over probity and legal issues, compile interview questions and ensure that each applicant experiences the same set of conditions. Our council shouldn’t need baby sitting…. Word is new Mayor, Paul Ng, made the request for the CEO’s inclusion, taking other councillors by surprise – but they voted it through anyway, except for an increasingly interesting young councillor, and real life recruiter, Pauline Tarrant. So where are we now in this messy process? Well, the span of time one or another panel member is away is six weeks (8 March to 15 April). However, although the advertising period ended 22 Feb, and the short list of applicants was agreed on 2 March, as at Friday 1 April CEO Russell advises that interviews for her position have yet to commence. Our current CEO’s contract is up 4 June, and the motion to council on the recruitment process advises the successful applicant “may have to give 2-3 month’s notice”. The situation just doesn’t add up. $3m Elec Vehicle sales, but Canning in dark ages? Whatever happens …. 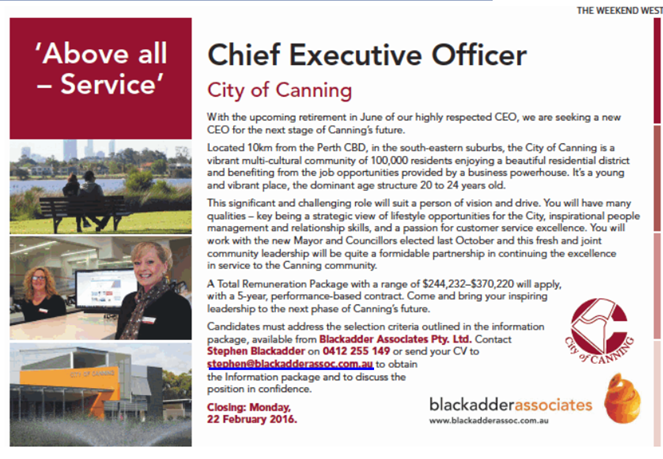 seeing CEO Lyn Russell leave is a very positive event for the City of Canning. Your comment with regards to the voting in of selection panel is incorrect as Councillor Tarrant was in fact at a toilet break when they voted! Surely too Diana, councillors are allowed to take a holiday …. especially if they were booked well in advance prior to gaining their position on council? Yes, I’ve noticed the new councillors take a LOT of pee breaks! All recorded as taking approx. 3 mins a bladder. That is a fast turnaround, all up! So, do you have knowledge that Councillors Margaret Hall and Lindsay Holland were and are away on holidays, during the CEO selection process? Fine, Cr. Patrick Hall also wanted to be on the selection panel but stood aside for Cr. Margaret Hall when the vote tied. Put him on, and Jesse Jacobs, who also nominated for the selection panel as I recall. Its not hard, babe!